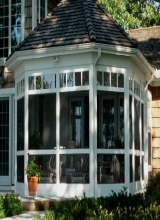 Porches are great additions that many homes have. They provide great spaces to relax and enjoy the outdoors. Bug and insects become a pesky problem because the congregate here and have an easy access into your home. Bravo manufactures flexible insect screens that attach to any window, door, or opening with Velcro™ fasteners. They are fastened securely and have a tight fit or seal. The mesh fabric prevents even the smallest bugs and insects in, while still allowing fresh flow of air circulation. In addition, they will not blow off or break. We use only the highest quality materials and craftsmanship, so you can be guaranteed that you are receiving a superior product. At Bravo, our products are custom made, so your product will fit properly and perfectly every time. There is no adjusting or modifying to make it fit. It fits right the first time you use it. We also offer several options to choose from, including different mesh types and different color Velcro™ fasteners for a better match. The mesh fabrics all provide complete insect protection and great visibility while viewing through it. They all are made from durable fiberglass mesh fabrics that ensure strength and longevity. You can choose from - standard fiberglass mesh, solar coated fiberglass mesh and pet resistant or pet proof mesh. The solar coated mesh blocks damaging UV rays, in addition to the sun's glare and heat. Thus, providing you with a comfortable surroundings. The pet screen mesh is seven times stronger than standard mesh so it will not rip, tear or become damaged. Bravo porch screens are a great way to protect your porch area and provide you with a comfortable, safe and enjoyable surroundings.